In many ways writing my Cars 2 review feels like writing my Frozen post (which is ridiculous because Frozen is a million times better) but they both inspire such vitriol in response it is a bit intimidating to talk about. Let’s get one thing out of the way first thing. Cars 2 was not made to sell toys. I’ve heard this so many places and it just isn’t true. Cars 2 was made because director John Lasseter loved the original and had always wanted to make a spy movie. It is so clear when you listen to the audio-commentary that he loves this movie and had a blast making it. Pixar has always had the philosophy of ‘only do a sequel if you have an idea’. Lasseter says in the audio commentary that he had the idea to do a spy movie, which would be completely different from the original and that excited him (which is the way Pixar likes to do things if you think about Toy Story 1, 2 and 3 they are radically different from each other). In many ways a spy movie for kids is brilliant. If you think about it most spy movies, the James Bond, the Mission Impossibles, even the Pink Panthers are too sexually explicit and violent for kids, especially small children under 5. So Cars 2 does introduce them to the genre in lots of ways and I think that is very neat. Do I think it is a flawed film? Yes but I like watching it. In some ways I think it is a little bit better than the original. The first has more heart and a better message but this is brighter, more colorful and moves at a much faster pace (this last watch-through I got a little bored with Cars). So there you go. The world doesn’t make sense and you just have to accept that at the outset of all the Cars/Planes movies. This admittedly may be easier for children to do than adults but for whatever reason I am able to make that leap. Once I accept the ridiculous world it is in, the story is kind of fun for Cars 2. It starts out with Lightning McQueen getting challenged by an Italian car to a race in the World Grand Prix. This race series is promoted by a Sir Miles Axelrod to promote his alternative fuel called Allinol. The plot with the alternative fuel does get pretty convoluted and complicated for a Cars movie but isn’t that usually the case with spy movies? 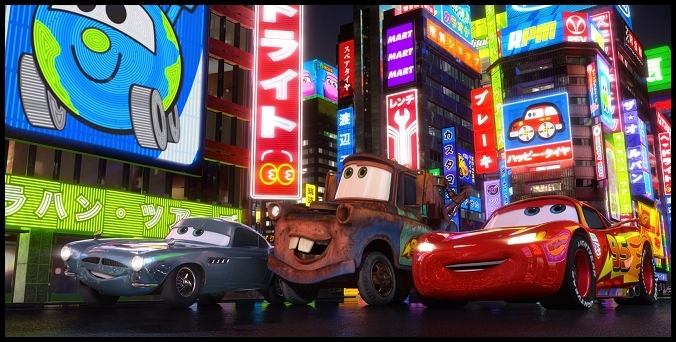 The World Grand Prix starts in Tokyo so Mater and Lightning head abroad and Tokyo is animated beautifully with light and color we haven’t seen before in a Pixar. I love the look of it. At the same time the race is happening we get introduced to a character named Finn McMissile who is first introduced to us in a great opening sequence with Finn spying on the central villains of the movie the ‘lemon cars’ (very clever I think). I mean take a look at this scene and if you were a kid who had never seen a spy movie don’t you think you’d be pretty enthralled by it? I like it. In Japan, McMissile mistakes Mater for an American secret agent, which our beloved tow truck is unaware. This plot is an homage to The Man who Knew too Little or even North by Northwest with the innocent at the wrong place and wrong time. However, the humor does get a little bit repetitive and grating at times. In fact, Mater starts to annoy Lightning who in anger tells him to stop bothering him and go away. I didn’t really like seeing the arguing in such a light silly children’s movie. Luckily it doesn’t dwell on it long. Eventually, Holly Shiftwell and Finn recruit Mater to help them hunt down the lemons convinced he is actually a genius. I really like the old school spy movie feel to the villain lemon cars. They are a lot of fun. 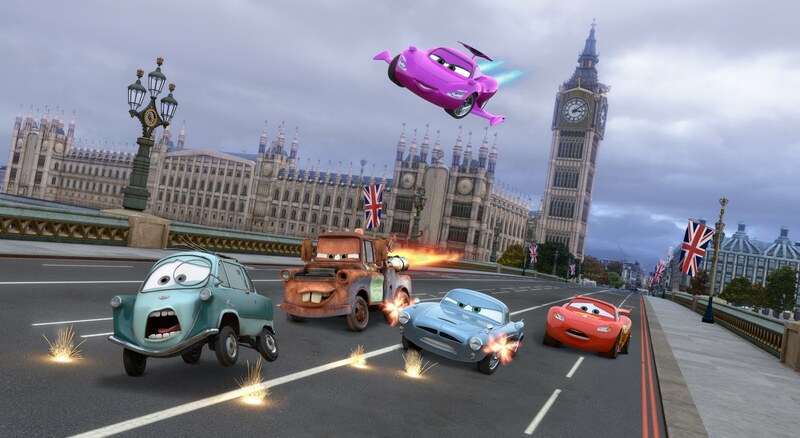 When the race moves to London they end up putting a bomb on Mater and there is a great chase scene where Mater, the Lemons, Finn and Holly, and Lightning are all racing around London. It’s really energetic and enjoyable to watch. I honestly think a lot of people who criticize Cars 2 haven’t actually sat down and watched it. They just hear the idea of Cars 2 or read some reviews and decide it’s the worst animated film ever. With all due respect it’s just not that bad. In fact, in many ways I think it is good. That said, where it falls short is the humor. I like Larry the Cable Guy, and I don’t mind Mater, but the schtick does get old in this film where it was still charming in the original. There are so many scenes of him being the idiot and that isn’t very funny, and like I said, the arguing with Lightning isn’t fun to watch. I liked some of the jokes about the lemon cars but you really missed the team feel of the original and perhaps got too much of Mater in this sequel. Another flaw might be that while I find the lemon car villains clever as an adult I don’t know if that makes sense to the small children the film is clearly aimed at? Do children know what a lemon car is? It’s a small nitpick however because the bad guys are clearly bad guys-monocle and all. 🙂 . The cars are also more like Transformers in Cars 2 than the traditional cars of the original, which for the most part all had the same limitations of regular cars. In here they can transform themselves, fly, drive on water, dive under water, shoot rockets etc. While that is entertaining, it does make it more of a Saturday morning cartoon type of entertainment than a thoughtful Pixar film. (Also Lightning doesn’t have stickers for lights any more. Upgraded I guess!). I certainly don’t want to oversell Cars 2. The world is nutty in the Cars universe to begin with, and if they had asked me I would have said ‘Do Incredibles 2 first!’. But Lasseter had an idea for a spy movie and what they came up with I think is entertaining. If you haven’t seen it I challenge you to actually watch it, and decide for yourself if you hate it or like me find something to enjoy about it. And perhaps watch it with little children- like the Minions, kids love the Cars movies. And as great as films like Inside Out are that challenge kids, I think there is a place for films like Cars 2 that simply give them a fun time at the movies. Awesome review once again! I’d probably go B- for this one. To tell you the truth, I kind of liked this film a little bit better than the first film as well mainly because of it being in a spy movie premise. I will say, though, that I was rather annoyed that Mater didn’t accept McMissile and Shiftwell’s offer to join hem on future missions. That is especially since Mater and Holly Shiftwell loved each other, you know? Well, if there’s a third one, here’s hoping they end up together for good, you know? Anyway, great review! Looking forward to Mor’du, Brave, and the rest of the remaining Pixar films that you still have yet to review. Thanks. Glad to have another person who finds something to appreciate in this film. I agree the first one is a lot slower and I think the spy premise is pretty creative. I wonder if we will see Holly and Finn in the next one. Because 2 was so unpopular I wonder if they will try do something totally different? So you finally passed me in my Pixar project, lol! Ha. You’ve got to step it up now! Just kidding. 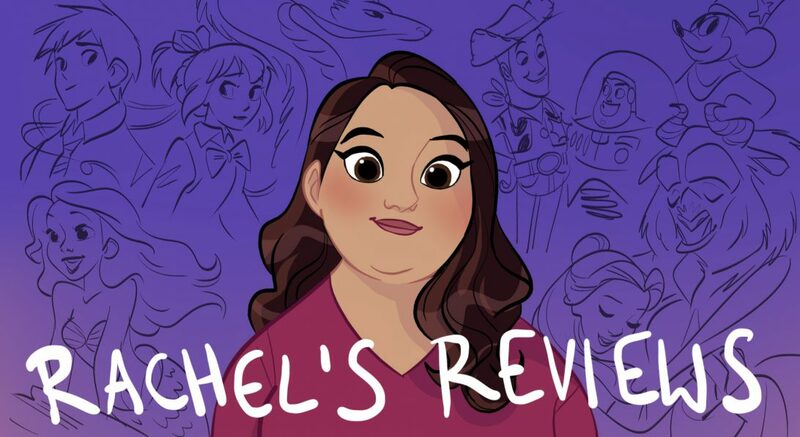 It’s funny that Pixar has taken me longer to review than the Disney Canon but I guess I was bedridden then so not much else to do. I am curious what you will say about Cars 2. Have you seen it before? Yeah I have. I’m still not sure how I feel about it. It’s an oddity for sure. I’m afraid I didn’t like this movie even though I do quite like the first one. I can accept the silliness of the universe, and the simple character-growth story of the first film fits that universe just fine, but using it for a spy movie of all things doesn’t really work for me. Neither does turning the comic-relief sidekick into the main character. And I could figure out who the evil mastermind was by process of elimination. The action and the voice acting are OK – it’s hard to go wrong with Michael Caine – but that’s it really. Yeah it’s hard to argue with your points. I do agree the humor falls flat and we get too much of Mater. I also think the villain is super obvious but I kind of thought the lemons were funny. It’s no masterpiece but there’s enough there to entertain me. Everyone is a film critic, John. Film critics are not pretentious snobs who only want something high-brow and sophisticated to praise. If they want only the best from you, so does everyone in your audience, even children. But his films in particular have never been unpopular with critics – they built his career if you look at the Rotten Tomatoes scores, yet he dismisses them as soon as they say something he doesn’t like. What he is doing is refusing to acknowledge the role the critical process serves – you see how what you’ve created appeals to someone other than yourself. And that’s something John simply cannot do. He just rests on his haunches thinking everyone loved it just because everyone went to see it, but that doesn’t mean they were happy when they left. That said it’s difficult to critique this movie. You said any 10-year-old boy would love Cars. Frankly, I thought it was tedious at worst and okay at best when I was a 10-year-old boy, but at least it had sophistication in hindsight. There was some effort in the story. This is made for 3-year-olds, and 3-year-olds probably will love it. But when they get older, I can’t help but think they’ll just marvel at the fact that it even exists. It is the worst Pixar film in my opinion, and one that justifies everyone who dismisses an animated film as “kids stuff”. The best I can say is this: This movie is like Roger Ebert said, John Lasseter playing with toys. That’s it. And if you’re a little kid and you get lost in imaginative intricate dramas the way I did with my toys, you will love this. Or at least understand it. I never said it was made for 10 year olds. In fact I said it is best for kids 5 and under. The Cars movies are made for little boys who in my experience love them. What’s wrong with that? Yes it is great when movies transcend to all ages but why do they have too? I have to say I actually agree with Lasseter in the video. You don’t make movies for the critics. You make the movie you feel passionate about and that you hope an audience will like (not necessarily all audiences). John Lasseter has made many, many films either as producer or director that people adore so the idea that he is somehow unable to get off his high horse just isn’t true. Few would argue that his leadership and vision practically saved not only Pixar but Walt Disney Animated Studios from a dark time they were in. He made 2 movies that some people like, other people hated. Let’s have a little perspective. The same could be true for Stanley Kubrick or Stephen Spielberg or certainly George Lucas. Even Alfred Hitchcock had the occasional film critics or audiences didn’t respond too. All directors have movies that are liked and disliked, even hated. They should not make the movie with the critics in mind. They should make the movie and let the chips fall where they may. The truth is nobody is a fortune teller and you do your best and see what people say. I don’t think Cars 2 is a masterpiece but I am entertained by it. That’s the only person I can speak for and I have watched it with little children and they always love it, so there’s that. And as far as it being beautiful and a fun movie as he says in the video- that is entirely subjective. He likes it. I enjoy it. Others hate it. Some like modern art. Others think it is junk. We all have different things we think are funny, or beautiful or fun. Some people don’t like Up and I think it is a masterpiece of storytelling. Takes all types. That said it is my second worst Pixar movie but I like all of them. I really do. Thanks for sharing your perspective as always. I’ve heard plenty of other people say the original Cars was made for 10-year-old boys. This one probably isn’t. The sentiment I ended with was actually directly in line with yours here: “The Cars movies are made for little boys who in my experience love them. What’s wrong with that? Yes it is great when movies transcend to all ages but why do they have too?……That’s the only person I can speak for and I have watched it with little children and they always love it, so there’s that.” I am sure that is true. I have a lot of respect for Lasseter for the many other great things he did and good projects he backed particularly the Toy Story franchise. I really do think though that he should take some time to consider why Cars 2 was so heavily criticized. What’s funny is you say you agree with Lasseter, yet you repeat the same statement I used against him: “You make the movie…. you hope an audience will like (not necessarily all audiences).” The problem comes when you say “You don’t make movies for the critics” right before. I feel this is a direct contradiction. You and Lasseter both commit the logical fallacy in thinking when you directly distinguish audiences and critics as separate bodies (if you want to dispute this, Lasseter specifically says “I don’t make movies for film critics, I make them for the audience”, and has written elsewhere “I typically don’t read the reviews…I think it’s clear that audiences have responded”). I only really take issue with Lasseter because of these statements. This is a petty attempt to create a group he and his fans can all be opposed to in order to create a false simplification of the issue (along the lines of Confused Matthew isolating “Kubrickians”). Cars 2 not only has a 39% on Rotten Tomatoes, it has a 6.4 on the IMDb. IMDb voters are not professional film critics. I view them as one and the same. Pixar has been a success with film critics and the general public since Day One, and Lasseter should be honest enough to admit that the same way Brad Bird has, who actually expressed appreciation for them despite being the man who created Anton Ego! I do wish Lasseter would be humble enough to just make that statement you did or refrain from commenting altogether: It’s all subjective. But you had said I said it was for 10 year old boys and I didn’t. Nevertheless, I do feel critics and audiences are different groups. Critics are professionals who see 300 some movies a year. This makes their opinions very different from the audience at large. I love film criticism and I think there is much to criticize about Cars 2. I just don’t think it is as bad as people make it out to be. I am entertained by it and I think it was made for a particular group in mind. John Lasseter made a movie some people liked it, some didn’t. It’s the same with all directors whether it be Michael Bay or Stephen Spielberg. I think they all make stuff they like for a particular audience and that audience responds one way or another. In general I’d say Lasseter is pretty respectful to the press. He’s certainly way less defensive over his failures than say George Lucas who can be petulant towards the fans and critics. I don’t see anything to censure in the video you shared. I really don’t. He made a movie he liked. Critics didn’t, many fans didn’t but some did and he’s happy with that. To me that doesn’t seem petty but merely having a different opinion (and many who did like it aren’t old enough to read or write their own imdb reviews!). Is he supposed to not like something he likes because other people don’t like it? Also most people in Hollywood don’t read reviews. I’ve heard this from actors, directors, producers. Most don’t even watch whatever they are in. Once it’s out there you’ve done your best and that’s all you can do. I am also positive the Brain Trust and Lasseter is taking the criticism of Cars 2 into account for Cars 3. Brad Bird is a member of the Trust so you can bet his perspective will be heard loud and clear. Along with Andrew Stanton, Pete Docter and more. So I wouldn’t worry about Lasseter and Pixar not taking that in whether they read the actual reviews or not. They know. I’m sure George Lucas is almost the worst of the worst in that regard. That’s why I hate seeing Lasseter anywhere near that. You are true about that surface difference between audiences vs. critics, but I think it is only a surface difference. I think the target audience for Cars 2 being unable to write complex reviews is also a surface difference. In the end, it all comes down to the Robert Warshow quote: “A man goes to the movies. The critic must admit that he is that man.” These are all people who expect only the best. 4-to-5-year-olds may settle for less, but that doesn’t mean they wouldn’t be even happier with something better, and someONE trying harder. That’s what Pixar was founded on, appealing to everyone in the audience, and that’s what Cars 2 failed to do. I think Lasseter could have at least admitted a lot of people didn’t like it and asked why. Joel Schumacher, contrary to popular opinion, has never directly said that Batman & Robin took a bad approach. He did, however, apologize to ANYONE WHO WAS DISAPPOINTED BY THE FILM but not for making it in the first place. I am aware most people in Hollywood don’t read reviews, and I think that’s mostly because they rely on box office receipts to determine popular success instead. John Lasseter has continually asserted that he is better than that. They should be interested in what the audience has to say, and many of the criticisms for Cars 2 simply make too much sense: Unlike the Toy Story sequels, it doesn’t even operate in the same spirit or low-key style as the original. The original message of “caring about Route 66” has nothing to do with this. Doctor Who has gone through multiple cast/crew changes as decades go by, but the concept and style of the show are still the same, along with what lies at the heart of the character of The Doctor. I think that’s mostly the reason people have stuck with watching the show and can even say that they are Doctor Who fans, because they have the one constant at least. Yet both he and Doug agree on Cars 2 being the equivalent of “sexual harassment panda” in its incongruity and would probably agree with my comments. I can be content with that and at least hope and pray for the optimism you exhibit at the end. That’s all I will say. Fair enough. I think it is more than just a surface difference. Even just doing these reviews non-professionally I find I have a very different point of view of most of my friends who see 2 or 3 movies a year. I am both harder and more accepting of films than they seem to be. I totally get the criticism of Cars 2. I certainly share in some of that criticism. I gave it a C+ which means to me it was average. Don’t you think it actually shows I am sharing my own opinion here and not just trashing Cars 2 because everyone else does? All the critics you mentioned like Doug Walker have their films they like that other people hate. Doug sticks up for Atlantis: The Lost Empire for example. I think that is a good thing. It shows an independence of thought. But I actually do know a lot of people in the animation community who stick up for Cars 2. It’s a spy movie and an entirely different genre so of course it feels different from the original. They tried something and for me I was entertained. For most it didn’t work. Anyway, thanks for sharing your opinion. I know you are part of the majority and I think that is great. You have to understand it’s just such a step backward from Toy Story 3 that it’s only to be expected that people so passionately hate it. I think it’s just at direct-to-DVD level of quality. 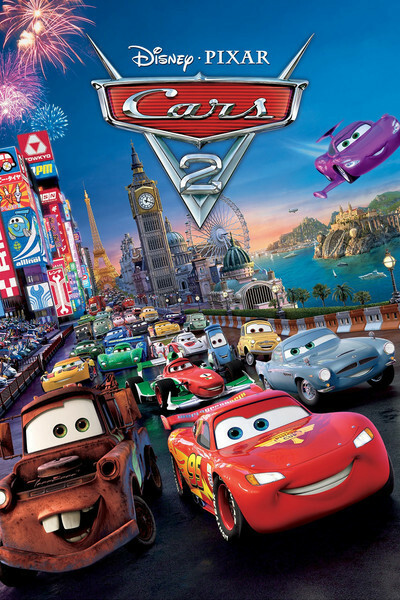 I flat-out loved plenty Disney direct-to-DVD sequels when I was at the age the target audience of Cars 2 is, but now I feel embarrassed even thinking about that and I have no desire to watch any of them again. Toy Story 3, I think most people will not be able to say the same about. Definitely agree with that. It is a big step back from Toy Story 3. No doubt about it. I can see what you are saying. But I did give Toy Story 3 an A+ and this a C+ so I think that shows the difference in quality. I just don’t think it is a total failure. To me it is an average film made for very small children. Oh well. I actually agree with that assessment but I think The Flintstones episode “Dr. Sinister” would make a better introduction to the spy genre if you want my personal recommendation. And FYI I watched Sherlock Holmes: A Game of Shadows and I do agree with you about that. The spirit of the character was gone, the plot was cliched and overblown, while the mystery was almost nonexistent except to set up fight sequences. It basically felt like a James Bond movie set in Victorian England, the bits from The Final Problem seemingly there just because every Holmes franchise has to go there eventually now. Will have to check out Dr Sinister. Sounds good. Totally on same page with Game of Shadows. Seeing Man from UNCLE made me realize I just don’t care for Guy Ritchie’s style of directing. Particularly the way he films action. That’s just a personal preference. It’s not wrong what he does. I just don’t care for it and it definitely doesn’t fit Sherlock Holmes to me. Pingback: Finding Dory Trailer Review | Reviewing All 54 Disney Animated Films And More! I watched Cars 2 today, which means I have seen all 16 Pixar theatrical releases to date! I’m with you on this one: I had fun, even though there were quite a few flaws. The animation was great (which I think can always save any Pixar film from being a complete bust) and I enjoyed Holley and Finn as new characters. I hope to see them in Cars 3 for sure just so we can see more Holley/Mater (I loved that scene where she announces she’s Mater’s girlfriend and everybody’s jaws just drop lol). Where would you go with Cars 3? Curious what your thoughts are on that. Thanks for inspiring me to watch this one; it was actually worth a look! Pingback: Pixar 39: Cars 3 – Reviewing All 56 Disney Animated Films And More! I don’t like how Lightning is pushed to the background for this movie.